Growing up, we always made pommes anna together as a family for special occasions. We had them for birthdays and graduations, all sorts of milestones. I still reserve this dish for these types of celebrations. 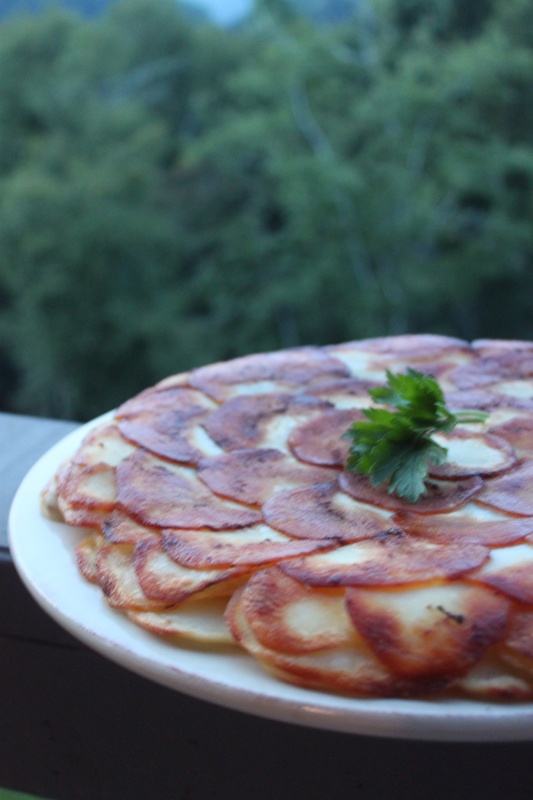 So I decided to serve Pommes Anna – with an even fancier twist – for a housewarming of sorts at my friend’s Jamey and Phil’s new mountain condo. It was also a fun group activity peeling potatoes, slicing with a mandolin and arranging layers. I put the hardest part of the dish on Phil – flipping the pan before serving. You can certainly skip the truffle butter and salt but its an over the top addition that will knock the socks off any guest. Truffle butter is easily available at The Fresh Market and you can purchase truffled salt at The Savory Spice Shop. Melt butters together. Brush the bottom of a nonstick pan. Meanwhile, peel and slice potatoes into thin and even slices (1/8 inch). Try to make the first layer as pretty as possible. After each layer, brush the potatoes with butter and season with salt and pepper. Once the pan is full, cover the top with foil and put something heavy and heat proof on top of it (heavy cast iron pots work well). On the stovetop, brown the bottom layer of the potatoes for about 5 to 10 minutes on medium high or until the bottom is brown. Then, transfer the entire thing to the oven for about 30 minutes at 350 degrees. Once the potatoes have cooked through, let the dish cool down a bit and then flip onto a large platter.